The Grain Sorghum Grower Meeting that was cancelled on March 3rd due to snow has been rescheduled for April 15th. It will take place at the Southern Piedmont AREC and lunch will be served. Registration is at 9:30 and the event will run from 10-1:30. Please RSVP to Laura Siegle one week in advance for the meal headcount. Call (804) 561-2481 or email laurab08@vt.edu. Contact us for a copy of the 2013 variety data. 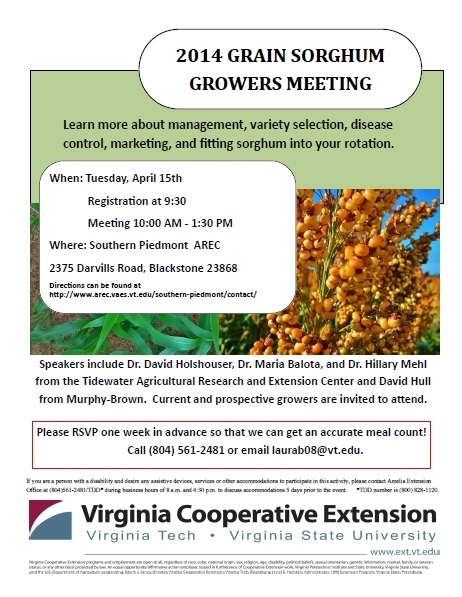 Due to the potential for dangerous travel weather tomorrow for our speakers and attendees, our Grain Sorghum Growers Meeting scheduled for tomorrow, Monday, at 10:00 at the Southern Piedmont AREC will be CANCELLED. We will keep you posted if we are able to reschedule, but in the meantime, don’t forget to attend the upcoming Wheat and Soybean Meeting on March 12th in Dundas. Call (434) 738-6191 ext. 4371 to register. Please call or email Laura at laurab08@vt.edu or 804-313-5396 if you have questions.